I'll stitch my socks until they can't be stitched anymore in an effort to get the most out of them. I realized this year, I have several pairs that really can't be fixed anymore. I should look up how to darn because a couple pair could benefit from darning, but I decided to ask for socks for Christmas. Above, minus one pair, is what I got. 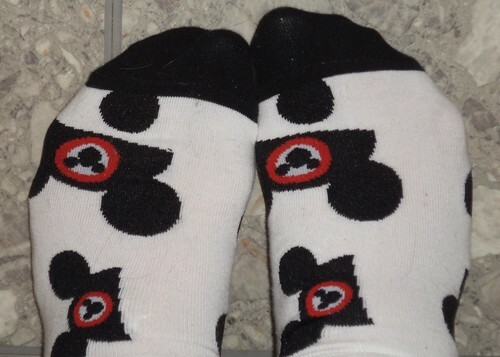 Carole went to Disney World in November and picked up a couple pair there. These were great inside my boots on a day when I had to wear boots to work because I hadn't shoveled to the Jeep. And who wouldn't love mouse ears? This pair was a gift from Jan, a late arriving package with a note, "I saw these at JoAnn's. Thinking of you and your loud socks." The rest in the box are from April and Perry. 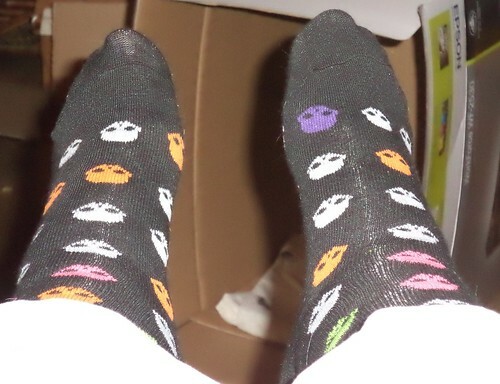 I can now replace one of the pair of Halloween socks I have had since man learned how to make socks. Those are skulls, or, maybe, aliens, but the effect is funny. 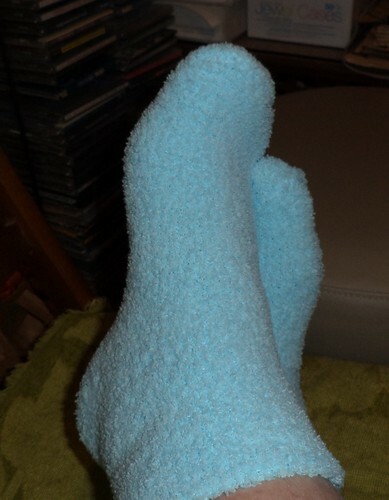 This fuzzy blue pair works great in my boots but I wear them to bed, actually. 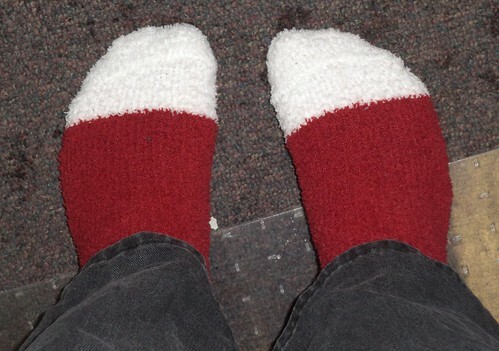 My toes can be really cold at night so I pull these on and I don't need a heating pad to keep my feet warm. 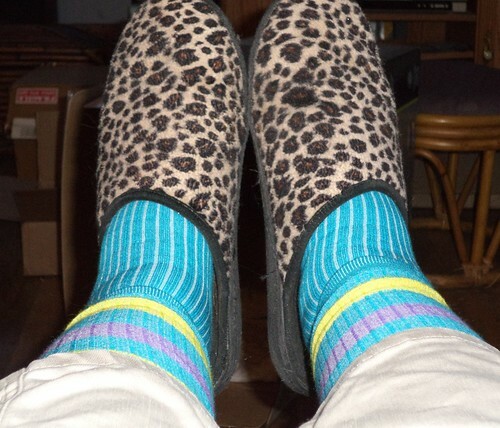 And, wearing them while wearing my slippers is guaranteed warmth. My mother always told me, "If your feet are cold, put on a hat." 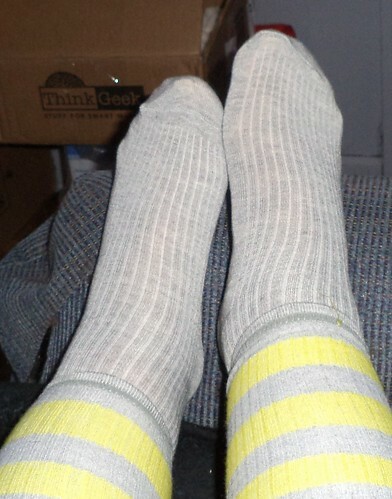 But I do think thick socks keeping the feet warm helps toward making the rest of you feel warm. Finally, there are the three pair of knee length socks. I used to wear knee socks exclusively. When I was in high school, the idea of ankle socks was ridiculous. That's what "little" girls wore, the ones in grade school. I remember having 3 pair of the very thin, white ankle socks with the lace around the cuff. I wore them to church and no other place. They were "church clothes". That's what I considered ankle socks when they were first out. Even "athletic" socks were knee length. It took several years before over the ankle or ankle-length socks were all the rage. Then I had a hard time finding knee-length and I was kind of forced into wearing those. 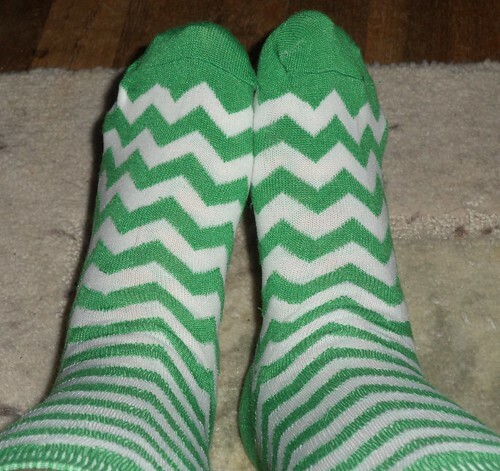 Now, ankle-length is what I wear and some of the best and loudest designs are on ankle-length socks. My legs are larger than they used to be and full knee-length socks can bind at the top or, I can't get them over my calves. When this happens, I simply fold the top down. That kind of makes them calf-length socks. They become the same height at my boots. This is a very good thing. I love the colors and the novelty of all these socks. I have charged myself with critically examining all my socks now and getting rid of the ones I really can't fix. 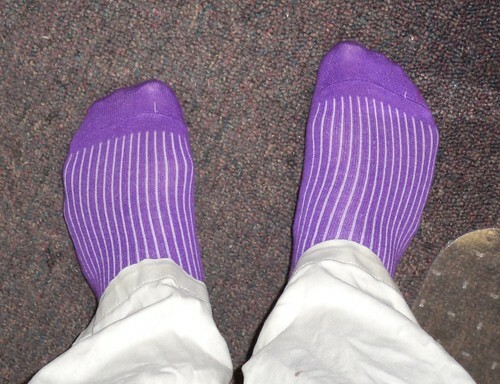 I realized, as I went through the week with a new pair every day, that new socks, ones that don't have holes in the toes or a see-through heel, keep your feet much warmer. They felt good, too, whole, not thin. The old socks will go in the dust rag pile. Have you ever dusted with a sock? It works really well. If you do any polishing of silver, slap on an old sock and polish away. You can toss the sock when you're through. Hmmmm...maybe that's a blog post. "101 things to do with old socks." Love the fuzzy blues! I've become a wool sock fan this winter. My toes are so warm!